A massive thankyou to the 48 members who attended and contributed to our AGM last Saturday. Apologies to the folk who were forced to stand due to the shortage of seats. The minutes are now on our blog PAPERWORK PAGE and also on our club Notice Board. The main outcomes are also included herewith. Thankyou to all of our members who listened and appreciated our thoughts regarding the fairness of our membership subscription and Bonus Ball system. Whilst the Bonus ball has given much resource to our club and provided some with a Saturday night treat it was now time to change. The proposal to scrap the Bonus Ball and alter the full membership subscription to £20, while still providing free tea/coffee and biscuits was voted for by 47 of the 48 attendees. We also include a Social Membership for £5 per year for those who can only attend to play on odd occasions, ie around 5 times per year, but still wish to be part of our club socially. Many even queued to pay straight away. Don’t panic though. If you could pay subscriptions by end of May that would be fine. Thankfully there were no changes to our committee with the fabulous crew prepared to continue a little longer. The Bonus Ball has been drawn last Saturday for our last time. Members who have paid in advance will be refunded or can arrange with Jane to use the money towards membership subscription if they prefer. This coming Saturday we have planned, I use the term loosely, a rare Singles competition. We will start with a few leagues followed by a knockout. We will probably do shortened league games to ensure we have enough time to get it all completed. 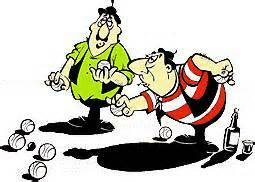 It is a different type of game that really makes you concentrate with only your three boules to play but equally good fun. For those that really can’t face it there will be room for social play instead. Please be there in plenty of time to do the draw for leagues. If members find it enjoyable we may look to run a singles ladder sometime soon. This entry was posted in Uncategorized on April 16, 2018 by clive1westley.